The West Herts was surprisingly quiet when I arrived for my pre-match refreshments. I did wonder whether a cup game against a team that we have faced regularly meant that the crowd would be depleted, but it soon filled up. I had the added pleasure of the company of my sister, who was a regular in the early 80s, but is now known to my Watford friends as Amelia’s Mum! Team news was that Flores had made six changes bringing Pantilimon, Paredes, Britos, Holebas, Suárez and Abdi in for Gomes, Nyom, Prödl, Aké, Behrami and Ighalo. So the starting line-up was Pantilimon, Holebas, Cathcart, Britos, Paredes, Watson, Suárez, Capoue, Deeney, Abdi and Amrabat. For the visitors, Watford Academy graduate Toumani Diagouraga (Dave), for whom I’ve always had a soft spot, lined up alongside former loanee Liam Bridcutt. 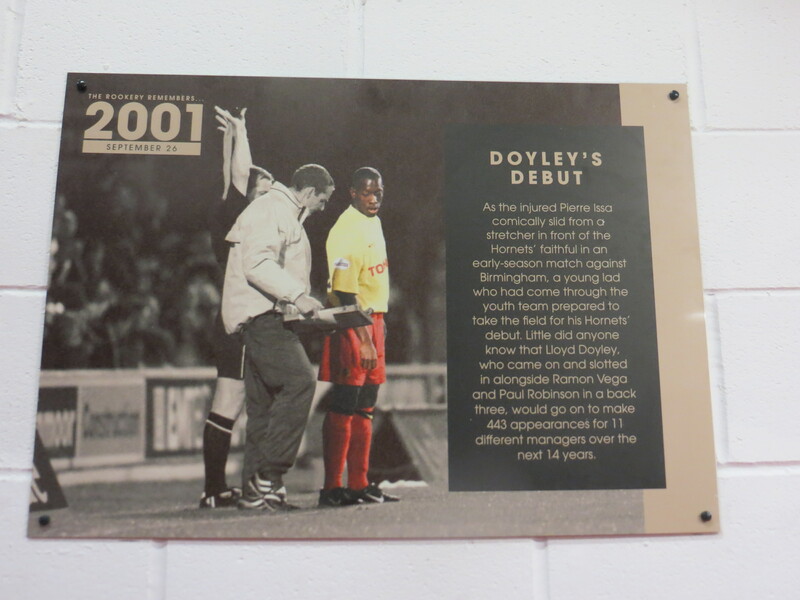 Walking through the Rookery concourse, I had to stop and take a photo of the poster marking Doyley’s debut. Much as I am happy that he has a new club, it is really hard to think of him playing for another team. As always on cup days, there were a lot of strange faces in the seats around us. Having seen the complaints on social media from Leeds fans that there were nowhere near enough tickets available for their massive fan base, I feared that we would have some opposition fans around us. But, thankfully, yet again, all of the new faces around us were Watford fans. Watford almost had a dream start to the game as Deeney met a Capoue cross with a header that was deflected just wide. Then a Watson corner was headed over by Britos when he really should have hit the target. The next chance came from a Holebas cross which Amrabat headed upwards so that it looped safely into the arms of Silvestri. Watson’s next corner was delivered deep and headed back across the goal and wide of the far post by Britos. 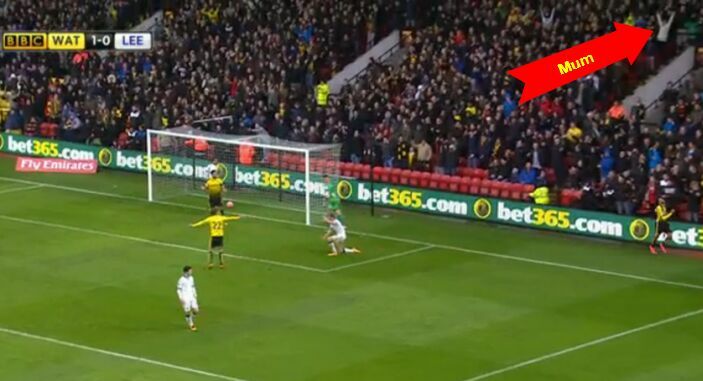 The visitors won a corner which was taken by Taylor and caught by Pantilimon who didn’t have to leave the ground. I’d heard that he was tall, but was taken aback to find out that he was a similar height to the bloke standing in the row in front at Palace last week. There was a moment of joy as Capoue nutmegged a couple of Leeds players before passing to Abdi who found Holebas whose shot was deflected for a corner. Then a cross came in to Capoue, who played the ball out to Abdi, whose shot was blocked. The first booking of the game went to Bellusci who was penalized for stopping Watford taking a quick throw-in. The first real attack by Leeds came through a dangerous looking break from Antenucci who played the ball to Dallas whose shot was very weak and easy for Pantilimon. Soon after, Dallas got into another good position, but the presence of Watson ensured that his shot was wide of the far post. The first yellow card for the home side came when Paredes pulled Taylor’s shirt. A silly booking to pick up. Watford threatened again as Troy battled past a couple of players before playing a through ball to Paredes whose cross was easily gathered by Silvestri. The visitors had a late chance to take the lead in the first half with a shot from Dallas that was deflected wide. The half time mood in the home end was one of frustration. Watford had dominated the game and Leeds had been rather poor opposition, but all our dominance in possession had not led to Silvestri being tested. In a similar manner to the first period, Watford had a great start to the second half. 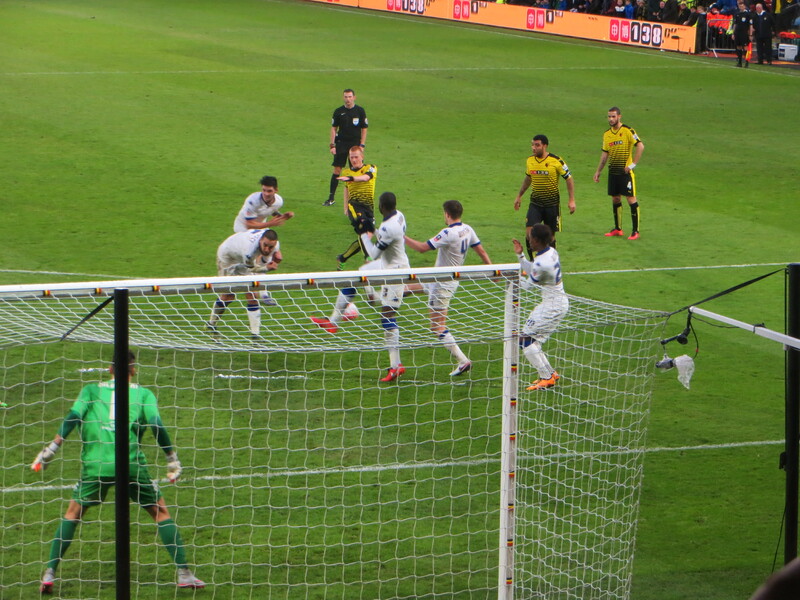 Deeney had an early foray into the box, but his shot from a narrow angle was blocked for a corner. Watson’s delivery was disappointing, but resulted in another corner from which the delivery was considerably better and was met by the head of Cathcart who put the ball over the bar. Bridcutt was the next player to find his name in the referee’s book for a tackle on Capoue. Watford continued to attack and a cross towards Cathcart at the far post was intercepted by Taylor who headed it out for a corner. But Watford took the lead very soon afterwards as a lovely cross from Watson was turned home by Wootton who was probably concerned that Deeney was just behind him, not knowing that one of his team mates had flattened the Watford man. Celebration of an own goal is always a bit odd for the players, but Watson received plaudits for his cross. The home side should have been two up very soon after as Abdi went on a great run, the Leeds defence opened up in front of him, but his shot was over the bar. A minute later, Watford thought they had scored a second as Holebas released Amrabat who crossed to Capoue who buried the ball. I heard the whistle before the ball hit the net but many others didn’t, including my sister whose celebration was broadcast on the BBC, as she discovered when the screen shot was sent to her by one of her daughters. Television pictures showed that Deeney was deemed to have pushed one of the defenders, but it was a soft foul and it seems much more likely that there is an unwritten rule that Capoue must not be allowed to score. The first substitution was made by the visitors as Mowatt replaced Dallas. Another Watford corner resulted in another Cathcart header over the bar. Leeds had their best chance of the game so far on 65 minutes as Bridcutt unleashed a stinging shot that was easily caught by Pantilimon. At the other end, Deeney broke into the box but, with only the keeper to beat, the angle was narrowed so he passed to Capoue who was tripped, but the referee waved penalty appeals away. Flores made his first substitution on 67 minutes replacing Amrabat with Ighalo. The Nigerian was immediately involved as he broke forward but he slipped before he could shoot and the chance was lost. Yet again Deeney battled into the box, but this time he was deemed to have fouled the defender and a free kick was given to the opposition. 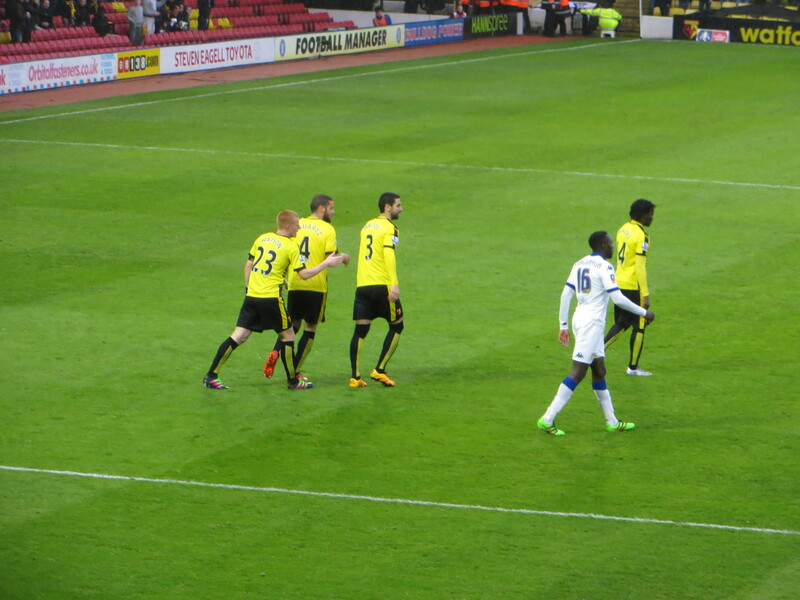 Quique’s second substitution saw Guedioura coming on for Abdi. The impressive Holebas went on a great run which finished with a poor shot that was easy for Silvestri. There was a break in the game as the perennially unpleasant Steve Evans kicked off about something. Flores wasn’t going to be drawn and retreated graciously. I think he was right in thinking that a Quique hug wouldn’t have helped the situation, and it would have been wasted on Evans. Guedioura played a lovely cross for Ighalo but the Nigerian was held off the ball so couldn’t connect. Then Deeney broke forward before finding Capoue who reverted to his usual accuracy in front of goal blasting well over and leaving me with my head in my hands. There was a rare attack from the visitors as Wootton broke forward before finding Doukara who hit the ball over the bar. Anya came on for Capoue just before the fourth official indicated an additional five minutes. In his first action, Ikechi went on a great run and crossed for Ighalo whose touch was poor so the chance went begging. 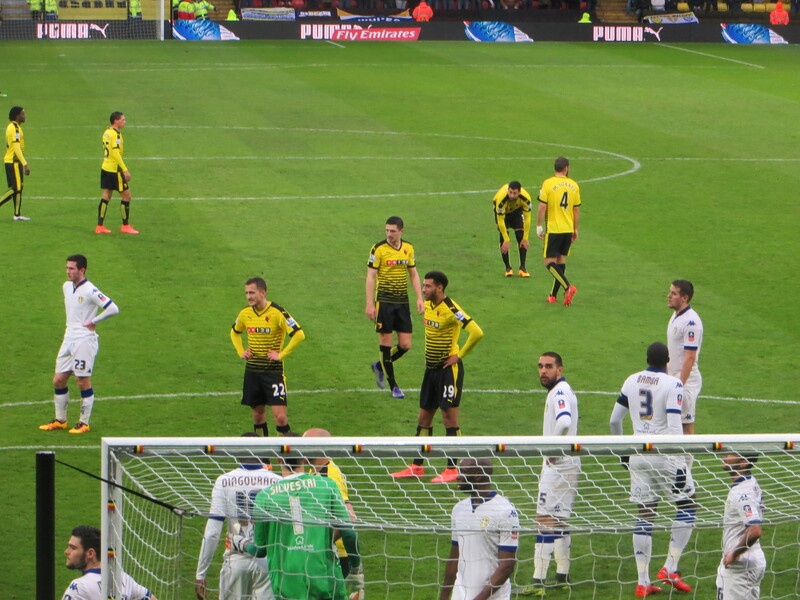 There was one last chance for the Hornets to make the game safe as Ighalo was brought down on the edge of the box. Deeney played the free kick short to Watson whose shot was low and into the wall. 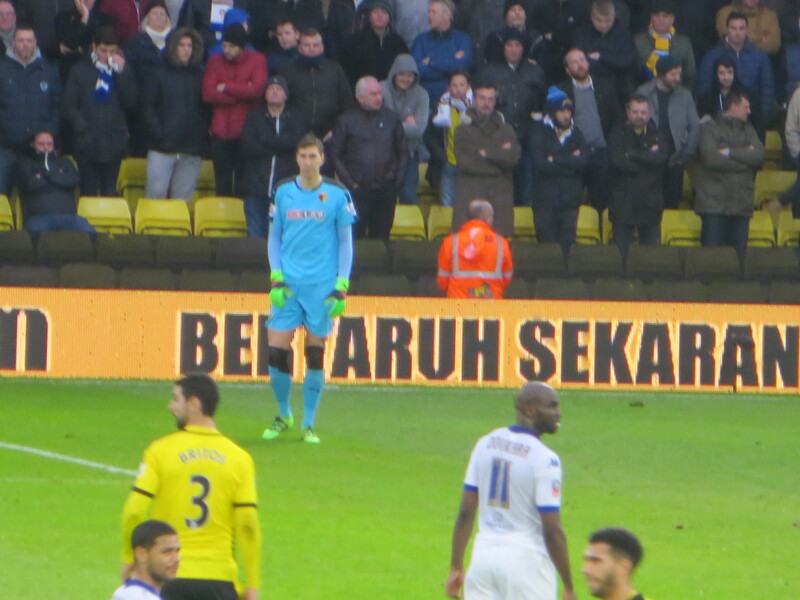 There was one final chance for the visitors as a cross was punched by Pantilimon to Doukara whose shot was blocked before the final whistle went to signal a Watford win. The young lad sitting behind me had become quite philosophical towards the end as he reasoned that, if Leeds did get an equalizer, we would win the replay. I wasn’t quite so calm about this outcome as I really didn’t fancy a midweek trip to Leeds in a couple of weeks. As we left the ground through the GT stand, there were Police horses at the hospital side of the ground and a large crowd of Leeds fans blocking the road and making snide comments about how miserable we looked. Having had a number of unpleasant experiences at Elland Road dating back to the late 80s, I would not have dared to have come out celebrating and was very happy to escape up Harwoods Road and back among the Watford fans making their way home. There were a number of people who expressed their disappointment at the narrow win, but it appeared to me to be an efficient win against a team that never really threatened. So we are in the quarter finals, but won’t know our opponents until a couple of days before the game when Arsenal and Hull play their replay. The prospect of facing Arsenal in the quarter finals will always evoke memories of 1987, the non-penalty, Luther scoring the third goal and GT ducking under a rain of coins which, unlike Chris Brunt’s experience, came from the opposition. Whatever happens from now on, being in 9th position in the table and the quarter-final of the FA Cup is pretty impressive. This entry was posted in Watford FC and tagged Adlene Guedioura, Alex Mowatt, Almen Abdi, Ben Watson, Charlie Taylor, Costel Pantilimon, Craig Cathcart, Etienne Capoue, Giuseppe Bellusci, Ikechi Anya, Jordan Botaka, Jose Holebas, Juan Carlos Paredes, Lee Erwin, Leeds United FC, Lewis Cook, Liam Bridcutt, Marco Silvestri, Mario Suarez, Miguel Britos, Mirco Antenucci, Nordin Amrabat, Odion Ighalo, Quique Sanchez Flores, Scott Wootton, Sol Bamba, Soulemane Doukara, Steve Evans, Stuart Dallas, Toumani Diagouraga, Troy Deeney, Watford FC on February 21, 2016 by franelynn. “…it seems much more likely that there is an unwritten rule that Capoue must not be allowed to score”. See you in the West Herts pre-Bournemouth on Saturday. Lee Probert isn’t the ref for that game thankfully…but Anthony Taylor of “Spurs at home infamy” is.